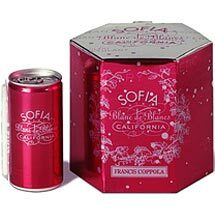 I remember the first time I ever ordered Sofia Blanc de Blancs sparkling wine at a bar and was absolutely stunned when the bartender brought me a champagne flute and a hot pink can. What the heck?? Wine in a can? Ewwwww. The precious pink can quickly won me over just because it was so darn cute with it’s peppy pink color and swirly white writing. While I thought the can clever and cute, I didn’t expect much from the wine. However, it was actually really good! I wouldn’t go so far as to say it’s the best I’ve ever had or anything, but definitely tasty. It was a bit heavier than I prefer my sparkling wines but the flavor and bouquet were very unique. The fragrance is almost like a perfume and the flavors are bright – think melon, lemon and honeysuckle. 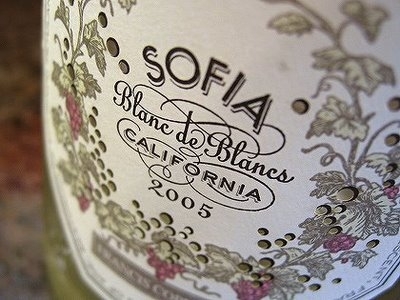 This wine was created for Sofia Coppola by her father, Francis Ford Coppola as a wedding gift so you could say it was created with love. I had actually almost forgotten about these little bubbly babies (as my juice usually pours from a glass container) until yesterday when I was at a surprise party being thrown to congratulate a friend. A friend of mine brought several 4-packs of Sofia Minis (this is what the cans are called) and they were absolutely adorable in the silver ice bucket. They come with little straws attached to them… perfect for saving lip gloss! So cute for a party or any time you need bubbles on the go (maybe poolside). Everyone oohed and ahhed and got such a kick out of them so if you’re planning on entertaining any time soon, the Sofia Minis might be worth considering. 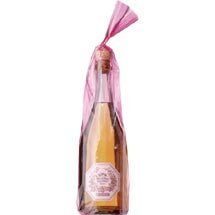 If cans aren’t really your thing, you can also purchase Sophia Blanc de Blancs in a bottle that is so lovely and comes wrapped in pink cellophane. The presentation of these wines is half the fun. Whichever you choose, bottle or can, it will definitely make a flirty and feminine statement. If you are in Houston, you should be able to find these wines at Spec’s. I actually found a bottle at Fountainview Liquors in the Galleria area for $17.99 which is a good price. I believe the suggested retail is around $19. This wine is made from a blend of Pinot Blanc, Sauvignon Blanc and Muscat grapes grown in Monterey County where they enjoy a long and cool growing season. This allows the wines to develop that crisp acidity that we all enjoy so much from our bubbles. There is one Sofia wine left for me to try and that is the Sofia Pinot Noir Rosé. It’s on my list! I’ll let you know what I think once I have a little taste. Until then, sparkle on my friends!